A Coveo .NET Front-End audience is made of Active Directory groups and users. 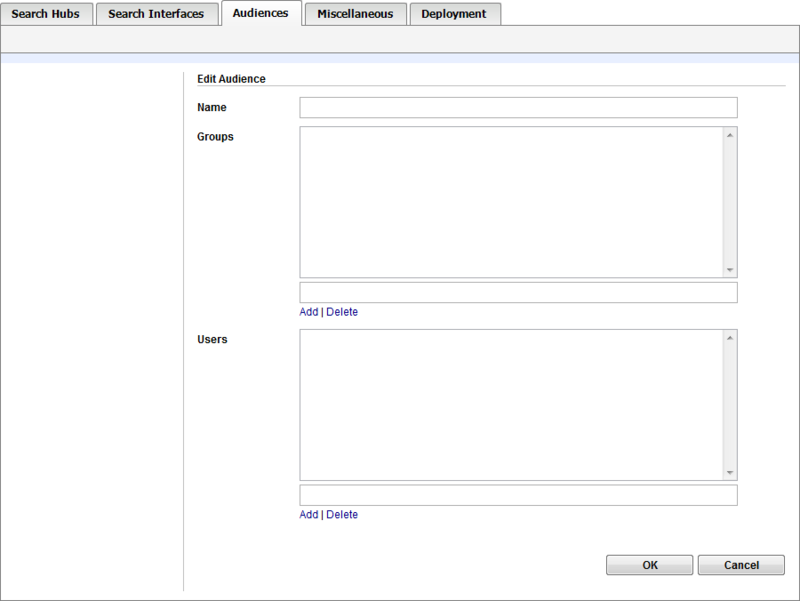 The purpose of audiences is to control access to .NET search interfaces within a .NET search hub (see Adding Search Interfaces to a Search Hub With the .NET Interface Editor). In the Name box, enter a descriptive name for the new audience. This name will appear in the page where you can add search interfaces to a search hub (see Adding Search Interfaces to a Search Hub With the .NET Interface Editor). In the lower box, enter the name of a valid Active Directory group/user for the current domain. Note: You cannot add a group or user from a domain other than the one in which the Coveo server resides. The group or user appears in the upper box when it is authenticated. An error message appears at the top of the page when the name is not recognized. To delete a group or a user, select the group or user name in the appropriate upper box, and then click Delete.